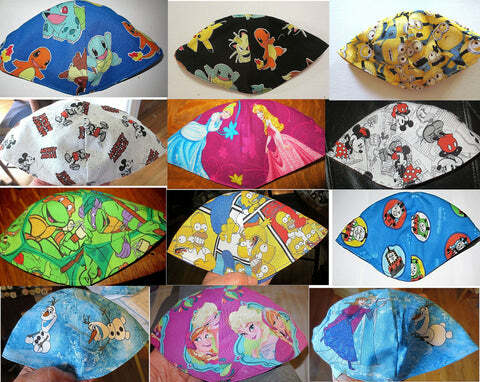 You can now go to Hebrew school, shul, attend Passover seders and more in style of your favorite Disney, TV or Movie character! You can select from Frozen Sisters, Olfa from Frozen, Just Mickey Mouse, Mickey and Minnie Mouse, Pokemon (blue or black backgrounds), Sponge Bob Square pants, Minions from Despicable Me, Thomas the Tank, Teenage Mutant Ninja Turtles, Curious George, Clifford the Big Red Dog, Sesame Street, Winnie the Pooh, Spiderman, Batman Bat signal, Star Wars themes, sports, The Muppets, PJ Masks, The Incredibles. regular size: approximately 8" diameter, 11" from one side over the top to side; Fits most kids from age 3 through adults please see how our kippahs fit, measure the person's head and ask questions if you are unsure. The toddler size approximately 6.5" diameter, 9" from one side over the top to the other side, circumference 20"
Traditional, standard style that sits on the back of your head, fully line with 4 panels of your favorite characters. This is not a Disney or any other type of licensed product. It is however, handcrafted from licensed fabric. I / TuffBags am not affiliated with or sponsored by any of these licensing organizations.